A new committee was formed to ensure this project is completed on a timely mannor. Committee members include: Bill Smith, Jeff Harris, Dave Commerford, Ken Iverone, Ray Searles & Jeff McGuire. If you would like to help, PLEASE let us know. This is a huge project and we can use the assistance. Well, the journey to bring our chapter back to the campus of URI is finally complete. Back from the Ashes! The best part, our newest brothers were initiated on 2/23/13 at the Newport Marriott - exactly 84 years from the date our chapter was founded on February 23, 1929. As you may know, several years ago, Brother Bob Meyer (’89) headed the effort to re-colonize the chapter. Soon after his quest began, Bob ran across an amazing group of undergrads and enlisted the help of our Province Archon, Andrew Danielson. As a result, we are proud to announce that our chapter has been re-chartered and officially recognized at the University of Rhode Island. For those of us who have had the pleasure to watch these young men as they worked towards this amazing step, we are extremely proud to call them Brothers. As we transition back to a thriving chapter, it is important that as many local alumni get involved as possible. Our next annual meeting will be Monday April 8th at 6pm at Gregg’s Restaurant in North Kingstown, RI. Please try to attend and voice your opinion as we start the process to support these amazing group of undergrads continue to become the top fraternity at URI. We will be planning future social activities, as well as reviewing some very important decisions. Please pass this email along to as many alumni as possible. We are very limited on current email addresses. 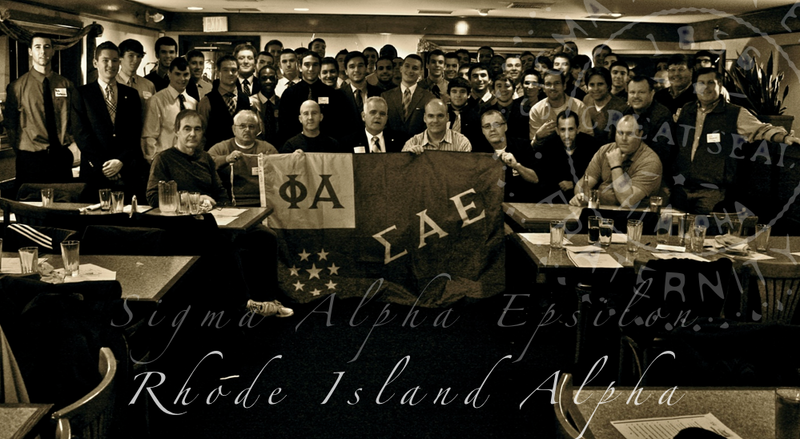 Please ensure your profile is added to www.rhodeislandalpha.com to receive future updates on the chapter status, alumni events, etc. It only takes a few moments and will ensure you are informed. Once again, the Alumni Board would like to congratulate, Bob Meyer and the undergrads on an amazing job. Please take a few moments to join us at this important annual meeting and voice your opinion & support. In December, 2010, Brother Bob Meyer ('89) was elected to serve as the Committee Chair and lead the re-colonization exploratory committee on behalf of the Brotherhood. I just had a nice long informative meeting today with the SAE chapterization guy, Aaron Hill, and July 20 and 21st will the the FIRM date for the undergrads getting our chapter back. Aaron will be sending me the details of the weekend and how it should be planned but in essence on Friday the 20th we'll have a short ceremony and then a followup dinner for a few people (details to follow) and then Saturday morning the 21st will be the formal ceremony where we take roughly 50 to 65 guys, brotherize them and grant them their/our charter. This ceremony is for all alumni and the undergrads only. Then that evening will be a formal banquet for all alumni, spouses, undergrads, dates, family, etc. At this point we need to send out notice to SAVE THE DATES of July 20 and 21st. We also will have to find a venue to host us that Saturday night for the banquet. And last but not least, we need a find a spot to do the ceremony on Friday night and Saturday morning. We all mentioned in a board meeting about using SAE's/IEP house's chapter room as the place to take us from out of the ashes and back as RI Alpha. Symbolic and simple IF that room is still set up as it once was. Aaron mentioned that alumni usually chip in for the banquet on Saturday night but we will need to discuss this as in essence we'd have 50-65 undergrads, their dates, us, our "dates" so we're talking about 100 to 150 people at least. He said that the guys were instructed to sell tickets to each undergrad and alumni but we also could kick in. We also should be pretty heavy handed in planning it. I will have more details soon but Jon if you could send out the SAVE THE DATES of July 20 and 21st for the ceremony AND the banquet. I walked out of that meeting very pumped. Great news from Aaron. He also added that he's figuring they WILL win the Bunting award as the best colony. This is all really amazing. Bob has been extremely successful while working with our Provence Archon, Andrew Danielson. I’m not sure if Jon sent out the broadcast update that I gave him last month but the colonization ceremony ison forSunday, July 24th on campus. It will be held in the library at 1pm, although the time keeps changing. I had a conference call on Friday with the colonization people as well as Andrew Danielson, province archon, to go over some details. Allbrothers are all welcome to attend. We will be colonizing 27 guys on that date as that’s all the guys that can make it for the ceremony. More will be colonized at a later date. The ceremony is pretty basic and quick but with 27 guys it will take a little time. After the ceremony they mentioned possibly heading to a restaurant for some food or cocktails. Those details will come during the week. I will update everyone during the week as to the EXACT time but at this point it is 1pm in the library on campus next Sunday. Thanks. How we got from 1 to 35 guys since the last meeting. I wanted to bring everyone up to date with happenings over the last week regarding recolonization. As everyone learned from our last meeting, I’ve been working quite closely with URI’s Greek Affairs office as well as with our Provence Archon, Andrew Danielson, to get this moving on campus. I’ve hung signs on walls, I’ve posted ads in the Cigar (the newspaper on campus), I set up a Facebook group page for SAE, I’ve had Boston area SAE’s come to URI and distribute SAE flyers on a couple of occasions, I’ve attended many of the IFC meetings and other Greek meetings and I set up a URI on campus email, sae_fraternity@mail.uri.edu. From my work so far I had found one very solid guy, Ryan Maughan, who I told you all about in our meeting. Ryan is a transfer freshman from Virginia Military Institute and he was involved in a hazing incident and transferred out. He saw some SAE flyers during the Boston SAE guys visit, went on the SAE website, saw my email address and Facebook account and contacted me. I’ve been working with Ryan and started getting a plan in place to hit the ground running in the fall with a rush plan since then. All this I told you all about during our March 24 meeting. Last week I received a phone call from a URI undergrad, Taylor, saying he too saw my ad. He went to Greek Affairs and was asking about how he and a group of about 20+ guys could become a fraternity and asked about SAE. Taylor told me that these guys on their own had formed their own structure like a fraternity but wanted to get more out of it and be recognized nationally. They had done some research on line about national fraternities. When they were at the Greek Affairs office the advisor told them about me and my efforts and what I was looking to do. They already saw my ad and went on the SAE website and decided to approach me. After an initial 30 minute phone meeting with Taylor last week, I called Andrew and asked him to come to URI for a meeting with everyone this week and scheduled it for Tuesday night (last night). He confirmed he could come and in fact coincidentally the Extension Advisory Committee (EAC) coordinator for SAE, Aaron Hill, was available so they both came down. The EAC puts a potential colony thru its paces and determines if it should move forward towards a colony and then a chapter. The timing was perfect. I scheduled the meeting for last night at 6pm in the Union and I rented out a room. I invited Ryan as well. As I was arriving at the room a steady flow of young men walked in, completely filling the room. I did a quick head count and counted out 31 people. I asked if this was everyone as there were more than I had been told, and Taylor said that because of prior commitments, they were 8 people that couldn’t make it, so there actually were 39 very interested undergrads. In the meeting there were 30 freshman and 1 sophomore with the 8 unable to make the meeting. The room was completely packed. Because Andrew and Aaron got stuck in traffic, I spent the first ½ hour alone with them telling all about my involvement, the chapter’s brief history since my pledgeship until 1994, my experiences with SAE and what I got out of it, and where we stood as an alumni group. Andrew and Aaron showed up at about 6:25 and explained where we go from here to them. We only could have the room until 7pm so we ended the meeting with the understanding that they needed to talk amongst themselves, and we would as well, and we’d reconvene to see if there was a common interest. They all left. As Andrew, Aaron and I talked for a few moments, they came back and said that unanimously they wanted to be SAE’s and wanted to go to the next step. Andrew, Aaron and I were quite pleased. Here is the next step. They need to each pay $85 to SAE and then they each get a Phoenix and a colony pin. Then with Aaron’s involvement, they have to get the basics together meaning putting some more SAE structure in place and then a colonization ceremony takes place. This could happen as soon as early May. From now until then they have to gather their funds and meet some of the basic SAE criteria, of which one is to have an alumni colonization committee. SAE will want to have 5 to 10 names of URI alumni that will help oversee this process. Not a lot of involvement at this point, but actually as a support group as SAE works very close with the guys towards this end of the colonization. If everyone is still on board with this, we need to have your name included in the list I need to provide to Andrew by the end of this week stating who is on this committee. Things are happening quickly so there’s no time to wait for another alumni meeting. Am I safe to include everyone’s name above on the committee? If you chose to not participate, please respectfully decline by Thursday night the 7th. Now is the time gentlemen. You chose me to do this, and I’ve done it. Now we all need to put in the time and effort to make this happen! "I just had a nice long informative meeting today with the SAE chapterization guy, Aaron Hill, and July 20 and 21st will the the FIRM date for the undergrads getting our chapter back. Aaron will be sending me the details of the weekend and how it should be planned but in essence on Friday the 20th we'll have a short ceremony and then a followup dinner for a few people (details to follow) and then Saturday morning the 21st will be the formal ceremony where we take roughly 50 to 65 guys, brotherize them and grant them their/our charter. This ceremony is for all alumni and the undergrads only. Then that evening will be a formal banquet for all alumni, spouses, undergrads, dates, family, etc. I walked out of that meeting very pumped. Great news from Aaron. He also added that he's figuring they WILL win the Bunting award as the best colony. This is all really amazing."